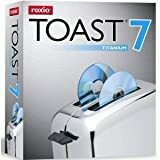 Burn your discs easier than before with Roxio Toast 9 Titanium for Macintosh. Toast is the standard for burning your data, music, photos, or video to multiple disc types including HD DVD and Blu-ray media. New Roxio Toast 8 Titanium complements the Mac OS and iLife software and sets the standard for burning CDs, DVDs, and now Blu-ray discs on the Mac. Create superior sounding audio CDs with smooth crossfades and transitions. Enjoy your TV shows anywhere with exclusive TiVoToGo and EyeTV burning. Convert and export video to iPod, PSP, mobile phone, and more. Burn files of any size, and automatically catalog the contents of your discs. Copy your audio CDs, movies and DVDs. There is no easier or faster way to save, share, and enjoy your digital media on disc. It’s your digital life, Toast It! Toast 8 at Amazon for $58 - free shipping / no tax. Toast 8 at Amazon for $58 - free shipping / no tax.Also a good bundle deal with Parallels. This is a newer tweaked tool for creating awesome backend media from a variety of resources.Convert DivX to DVD and create DivX discs and other cross-media functions.